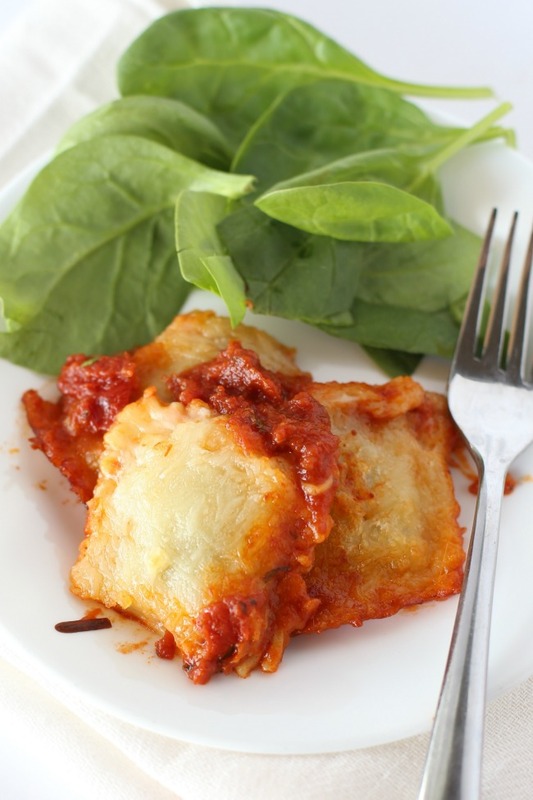 Cheesy Baked Ravioli is one of our favorites easy recipes to make on busy days! It’s a family favorite that’s perfect alongside a salad or green beans. You can also make this in a slow cooker ravioli recipe too if you want to pop it in before you head out the door and let it cook for a few hours! This is such a simple recipe, that even the kids can make it! In fact, our Facebook Live Kids in the Kitchen Cooking show demonstrated just how easy it was on the last episode! You can see it below and exactly how they made it as well as Ice Cream Cone Cupcakes! Start by pouring the pasta sauce in the bottom of a 9×13 pan make sure the pan is completely covered with the sauce! Next, layer the frozen ravioli in the pan on top of the sauce. They can be touching – so make sure you add a lot! Top with the mozzarella cheese and back for 25 minutes at 350! I have done layers of this in the pan – so after you top with the cheese repeat the steps and add another layer of sauce, ravioli, and mozzarella. This gives it a little bit of a lasagna feel. 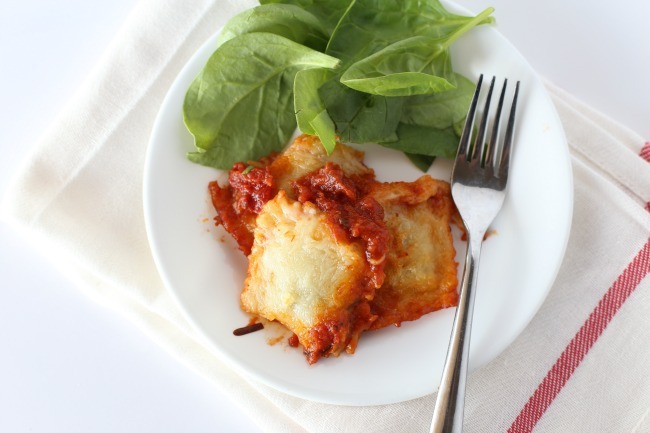 Serve this dish with a salad and breadsticks for the perfect simple weeknight meal recipe! Cheesy Baked Ravioli is our families favorite recipe to make – everyone loves it and it’s so easy to make that I can throw it together in a matter of minutes! 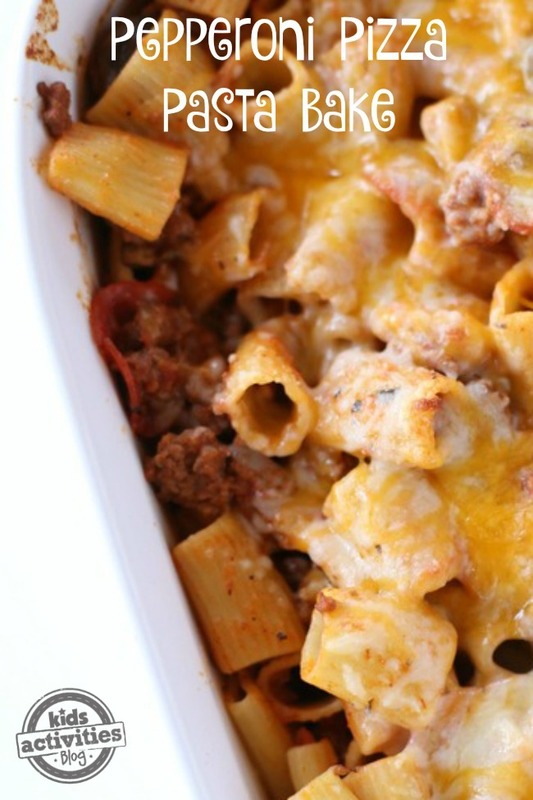 If you think this recipe sounds good be sure to check out our Pepperoni Pizza Pasta Bake – it’s just as easy and the kids will love the pizza taste! These homemade pizza balls are also sure to be a big hit among family and friends! Or if you’d like to try something new, then check out this Creamy Butternut Squash Soup. For more delicious recipes, please follow us on Facebook!